What Is a "Professional Learning Community"? 1. Create a collaborative culture. 3. Align our resources and time to focus on results. The Mt. Adams School District School Board signed a Resolution on November 21, 2016 resolving to make a three-year commitment to the district for the development of PLCs. Buildings are developing intentional implementation strategies to fully engage PLCs to support the District’s Mission of “Continuous Student Learning” and Monday professional learning time is set aside for teachers to engage in focused conversations to support student engagement, learning and increased academic achievement. Our first step was for PLC teams to determine Essential Washington State Learning Standards for grade levels/content areas. 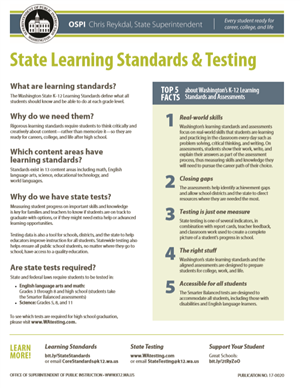 The district and teachers ensure these standards will be taught and your students will have every opportunity to learn them. In the left column, you will find the Essential Learning Standards by school and subject. These are a work in progress and will be revised throughout the year(s).